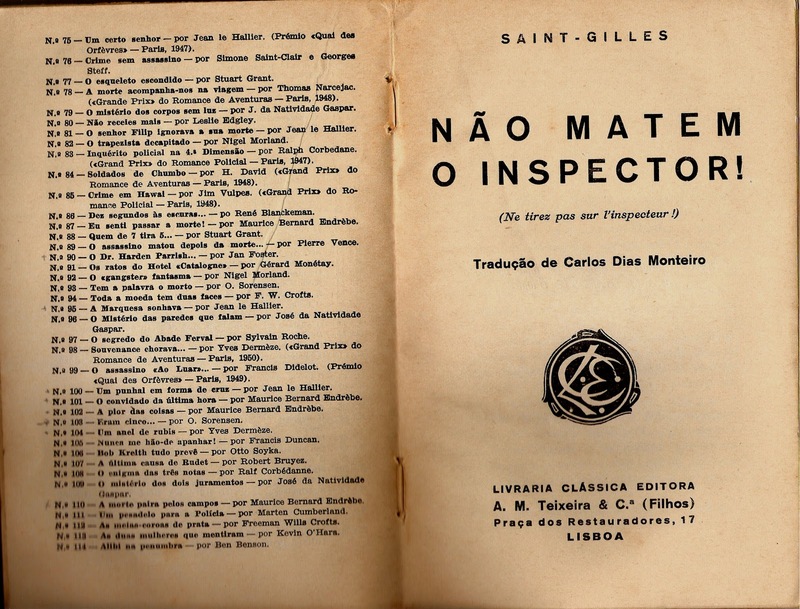 The Lisbon-based publisher Livraria Clássica Editora launched in the early 1930’s a Series of International Crime Fiction classics : Os Melhores Romance Policiais. This series was interrupted in the mid 1950’s. It consists of 124 volumes. The two first authors published there were two Belgians, both from Liège. The first one was Stanislas-André Steeman (1908-1970) with Seis homens mortos (1932).The second one, of course, Simenon. The series would publish two other successful Belgian authors after the war (both hidden under the pseudonym Paul Kenny). French Language Crime Authors are certainly over-represented there. In an era when the British authors members in the Detection club (including Chesterton, Anthony Berkeley, Agatha Christie, Freeman Wills Crofts, R.Austin Freeman, Ronald A. Knox, A.E.W. 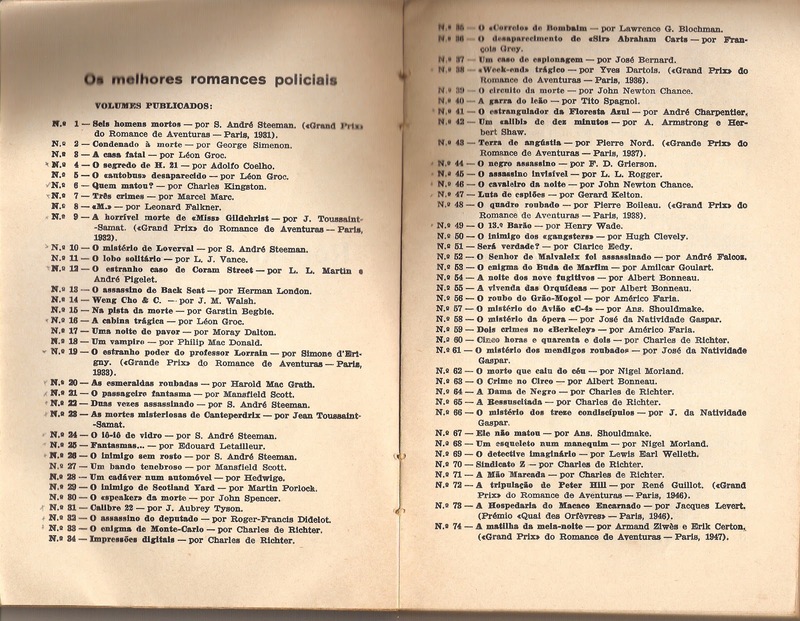 Mason, Baroness Orczy, Dorothy L. Sayers, Henry Wade, and Victor L. Whitechurch ) asserted their worldwide dominance, Os Melhores Romance Policiais published mainly translations of French works originally published by Gallimard, Ferenczi or Librairie des Champs Elysées, in series such as Le Masque or Crime et Police. -Algeria born and Cambridge educated Charles de Richter (1887- 1975), who published many thrillers inspired from Edgar Wallace in the Éditions de France Series ” À ne pas lire la nuit”. -Jean-Toussaint Samat (1891- 1944), a former journalist with Le Petit Marseillais who published in Le Masque and in a number of other French Series of the 1930’s, for Baudinière, Ferenczi, and Editions de France. -Marcel Marc, author of Les Trois Crimes de Veules-les-Roses (Gallimard, 1931). The list includes, too, Pierre Nord, Louis-Léon Martin Edouard Letailleur and Léon Groc, Francis Didelot and Maurice-Bernard Endrèbe.